How would you begin to explain the rapid rise of the Mongols to their global imperial status? Why did the Mongol Empire collapse so completely? What are the most interesting ways that Genghis Khan and the Mongols have been used as a symbol in the centuries since the collapse of the Mongol Empire? What has Genghis meant to different groups of people at different times? Who has viewed the Mongols positively, and why? Who has had a more negative view? What has been the history of the Mongolian people in the recent past and how has this contemporary history and the politics of the more distant past intersected? Dan Levin, "Tsonjin Boldog Journal: Genghis Khan Rules Mongolia Again, In A P.R. Campaign," New York Times, August 2, 2009. 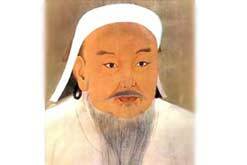 "Genghis Khan," In Our Time, BBC Radio 4, February 1, 2007. Ian Frazier, "Invaders: Destroying Baghdad," New Yorker (April 25, 2005). Jeremy Plester, "Weatherwatch: Climate Helped Genghis Khan Create The Mongol Empire," Guardian, September 23, 2012. "Ship From Failed Mongol Invasion Found Off Japan," BBC News, October 25, 2011. William Leith, "If Only Tony Blair Had Paid Attention To Genghis Khan," Observer, March 15, 2009. 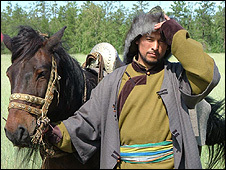 Mark Savage, "Genghis Puts Russia On Cinema Map," BBC News, May 23, 2008. Elliot Sperling, "Whose Historical Facts? : The Mongols, Mao And The Dalai Lama," New York Times, April 13, 2008. "Three-Year Genghis Khan Trek Ends," BBC News, September 23, 2007. 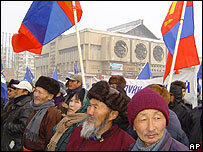 Daniel Griffiths, "Post-Communist Mongolia's Struggle," BBC News, January 11, 2007. "Genghis Khan May Get Protection," BBC News, October 6, 2006. "Genghis Khan Beer? : Mongolia Grimaces," New York Times, October 6, 2006. "In Pictures: Remembering Genghis Khan," BBC News, July 11, 2006. 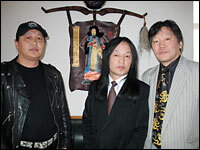 "Mongolia Rocks To Khan Opera Show," BBC News, May 27, 2006. Jehangir S. Pocha, "Mongolian Leader Seen In New Light; Genghis Khan Now Regarded As Great 13th Century Ruler," San Francisco Chronicle, May 22, 2005. Jennifer Quinn, "Guide To Management, The Genghis Khan Way," BBC News, April 25, 2005. "Palace Of Genghis Khan Unearthed," BBC News, October 7, 2004. Jonathan Watts, "Genghis Khan 'Was A Contemplative Chap,'" Guardian, August 24, 2004. Jonathan Watts, "Heirs Of Genghis Khan Swap Steppe For City," Guardian, July 24, 2004. "Taking The Genghis Khan Test," BBC News, July 14, 2004. 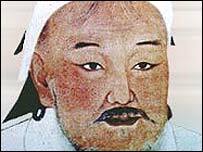 "Genghis Khan DNA Test Is Offered," BBC News, July 3, 2004. Gregory M. Lamb, "Embrace The Inner Genghis," Christian Science Monitor, March 23, 2004. Sue Bradbury, "Khan Of All He Surveys," Guardian, March 20, 2004. 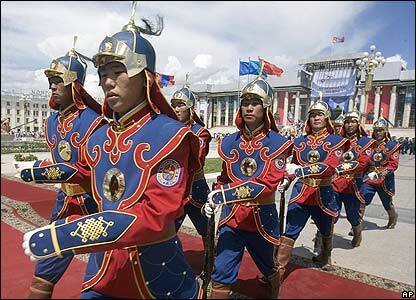 "Mongolia's Cult Of The Great Khan," BBC News, August 12, 2003. 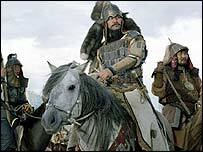 "The Hunt For Genghis Khan," BBC News, May 27, 2003. Michael Kohn, "First Came Khan, Now Bush: Mongols, Americans -- In Baghdad, Invaders Seem Similar," San Francisco Chronicle, April 12, 2003. Leigh Montgomery, "A Mongol Stereotype Debunked," Christian Science Monitor, January 9, 2003. 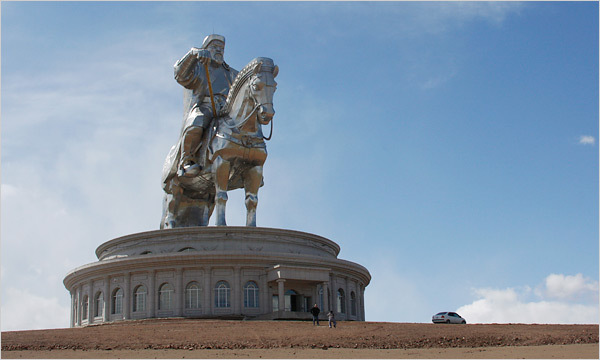 "Mongolia Glorifies Genghis Khan," BBC News, May 3, 2002. "U.S. Scientists 'Track Genghis Khan,'" BBC News, August 17, 2001. John Noble Wilford, "Thump At A Grave Site Hints At Riches Of Genghis Below," New York Times, August 17, 2001. "Genghis Khan," Guardian, April 21, 2000. "Study Shows Mongols Emigrated To Andes," BBC News, November 29, 1999. Bill Donahue, "Flogging Genghis Khan," Atlantic (September 2010). Kerry Brown, "The Cultural Revolution In Inner Mongolia, 1967-1969: The Purge Of The 'Heirs Of Genghis Khan,'" Asian Affairs, 38 (July 2007): 173-187. "Battle For Mongolia's Soul," Economist, 381 (December 23, 2006): 60-62. Robert Durden, "Genghis Day," New Statesman, June 19, 2006. "Genghis Khan," The Ark, ABC (July 4, 2004). 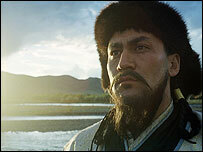 Howard Chua-Eoan, "Genghis Khan," Time, (December 31, 1999). "One Steppe Back," Economist (December 23, 1999). Mike Edwards and James L. Stanfield, "The Great Khans," National Geographic, 191 (February 1997). Mike Edwards and James L. Stanfield, "Genghis Khan," National Geographic, 190 (December 1996). Michael D. Lemonick, "The Khan Collection," Time (September 26, 1994). Adam Kessler, "Genghis Khan," USA Today Magazine, 122 (May 1994). "Genghis Khan And The Mongols," ABC Local Overnights, October 2, 2013. "Searching For Genghis Khan," On Point, NPR, August 4, 2011. 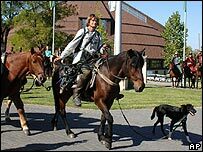 "Ancient Mongolian Competition Ties Past To Present," NPR Morning Edition, September 11, 2009. "A New Beat Gives Young Mongolia A Voice, Identity," NPR Morning Edition, September 10, 2009. "Khan! The Rock Opera," NPR All Things Considered, April 17, 2006.
: A lavish virtual exhibit from Columbia University's Asia For Educators. Mongolian History Resources: A portal compiled by the Indo-Mongolian Society of New York. Scrolls Of The Mongol Invasions Of Japan: A web-site from Maine's Bowdoin College.